The UK hosted a festival across the country to celebrate and honour the humble seed. In London, the Lambeth Garden Museum hosted farmers, growers, food sovereignty campaigners, artists and chefs for 2 days of workshops, talks, storytelling sessions, artists, games and film screenings. The festival acknowledged the importance of seeds and our responsibility to protect all their biodiversity from corporate theft if we are to protect the health of our children and the planet. The event rightfully acknowledged the growing community of small farmers and gardeners who are safeguarding thousands of years of knowledge in food production and seed saving still vital in feeding the world today. As stated in the recent UN Commission of Trade and Development report, small holder farming is what is needed to feed the growing global population, not industrial systems . October is Food Sovereignty month, and October 16 was World Food Day, both coming at a time when recognising the importance of the seed is more critical than ever. In UK and much of the rest of Europe, the industrialised farming system means that farmers are no longer saving seed as they had done for millennia, maintaining local varieties and cultivating regional biodiversity. High yielding and hybrid varieties now dominate the market, designed for large-scale high input industrial farms. A 2005 study found that on the European seed market, 74 % of cauliflower varieties were hybrids, as were 80 % of carrots, 85 % of calabrese, 87 % of spinach, and 89 % of tomatoes . Hybrid seeds are not worth saving as the yield goes down after the first year of planting due to the loss of ‘hybrid vigour’, the increased yield of hybrid seeds from crossing two inbred varieties. These hybrids have replaced open-pollinated varieties. Seminis, a European seed company bought by Monsanto in 2004, had previously deleted 2000 open pollinated varieties from their stocks, but these varieties still remain available to Monsanto for their breeding programmes. 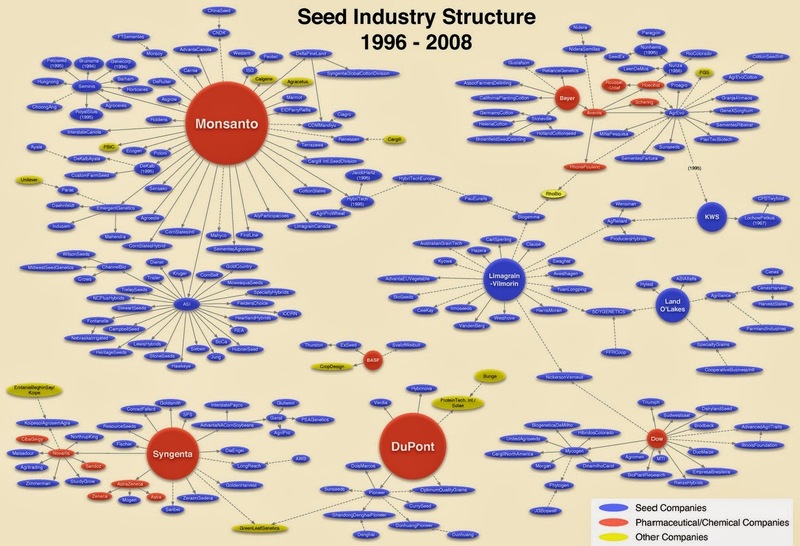 Monopolisation of seed is not just a European issue but a global one, with international agritech giants buying out independent companies and leaving farmers with little choice but to purchase hybrid or genetically modified seeds in countries like the US. 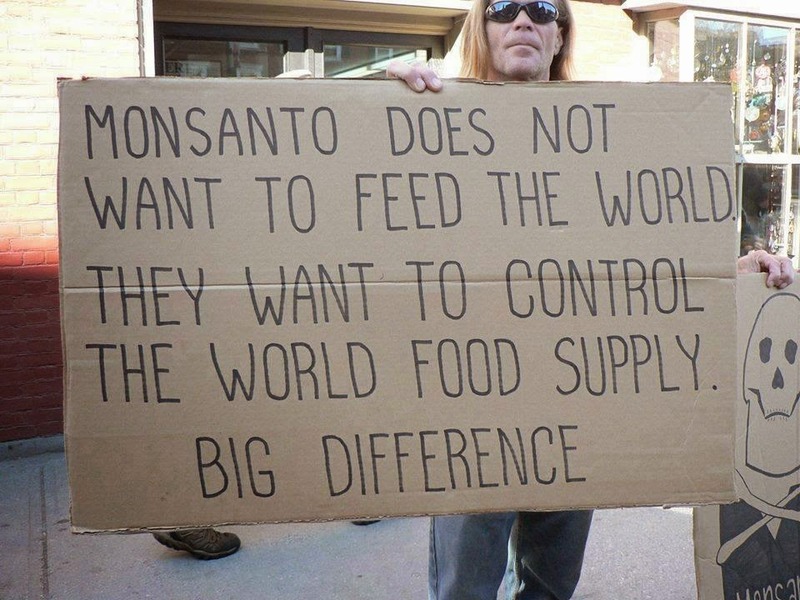 Monsanto bought 200 US independent seed companies over 10 years, with the corporation now estimated to own 23 % of the proprietary seed market (see  GM Crops Destroyed by Drought in US while non-GM varieties Flourish, SiS 56). A similar drive for seed monopoly is taking place in the African continent, with SeedCo, one of Africa’s largest home-grown seed companies being bought out by transnational corporations Limagrain, the biggest seed and plant breeding company in the EU. Limagrain is investing US$60 million for a 28 % stake in SeedCo . SeedCo has sold 49 % of its shares in Africa’s only cottonseed company Quton to the Indian company Mayco, a Monsanto subsidiary. Syngenta in 2013 took over Zambia’s MRI seed, which is said to have the most biodiverse collection of maize seed varieties in Africa. South Africa’s largest seed company Pannar Seed was recently taken over by Pioneer Hi-Bred, a subsidiary of DuPont. These acquisitions of seed companies by a handful of corporate giants poses great threats not only to seed biodiversity, but also food sovereignty and people’s access to fresh foods, giving GM companies the chance to spread their patented seeds across the world. Monsanto, Syngenta and DuPont already own 53% of the global commercial seed market and the following legislative proposals and treaties are set to increase their monopoly . Proposed changes to the EU seed laws (EU Plant and Reproductive Material Law) will further restrict the varieties of vegetables that can be saved and sold, threatening small and independent seed companies as well as small-medium scale commercial farmers. The proposed changes have been considered a gift to industry, allowing unrestricted marketing of patented seeds, favouring large companies with an expensive process of seed registration. A draft of the proposals was rejected earlier this year, and it is as yet uncertain what new drafts will be put on the table. Patrick Mulvany, a policy advisor involved in the negotiations of the treaty said at the October 15 meeting in UK’s Houses of Parliament, “it’s not that we don’t want laws, but we want the right ones” for protecting biodiversity. Previous drafts of the proposals make clear that the legislation is designed for big industry which is being called the “consumer”, not small-medium commercial seed companies and farmers which would likely go out of business if the price for registering each seed variety is set at £2 000. New proposals also favour distinct, uniform and stable varieties such as hybrid seeds which due to their uniformity, are also the most vulnerable to unpredictable climate change and pest attacks. As Patrick later emphasised, “we need to re-imagine new rules that realise farmer’s rights and regulate industry”. Biodiversity is also threatened by offsetting schemes that are supposed to charge companies for the biodiversity they destroy. This type of scheme not only encourages the destruction of land and biodiversity, but gives contentious green credentials to development strategies and companies that commodify nature and send out the message that nature is replaceable. As stated in an open letter to the EU Environment Commissioner Janez Potočnik protesting the latest EU proposals for biodiversity in the region, signed by 67 organisations and over 9 000 people, it provides a ‘licence to trash’ and the UK government has been quite open that it will speed up planning permissions . The UK government has already carried out small pilot schemes that have failed miserably, with not a single company involved making a single offset in the six counties that participated. In another threat to food sovereignty, countries are being pressured to implement stricter plant variety protection regimes and adhere to the 1991 International Convention for the Protection of New Varieties of Plants Act of the International Union for the Protection of New Varieties, known by its French acronym UPOV. This act is officially designed to give acknowledgement to breeders for new plant varieties, offering intellectual property (IP) rights for breeders and farmers. UPOV is an intergovernmental organisation based in Geneva. The act was first created in 1968 and has been revised since then, with most countries now being members of the 1978 Act or 1991 Act of UPOV. The latest version differs significantly from previous ones, covering all plant varieties instead of just national varieties; IP protection lasts for 20 years instead of 15, and governments are entitled to decide whether farmers shall be allowed to harvest material from a protected variety for any purpose, while previously they were permitted to use them for any purpose. Crucially, under the 1991 UPOV Act farmers would not be allowed to exchange or sell such material. This 1991 version of the act may function to some extent when applied to already commercialised farming systems but when applied to small farmers across the world who rely on informal seed exchanges and saving for food production, this new act will impact on the human rights to access to food and further erode the biodiversity that farmers depend on to deal with exigencies such as pest attacks and the vagaries of climate change. A recent human rights impact assessment of UPOV 1991 Act presented case studies in Peru, Kenya and the Philippines, stating that  “Concerns have ... been raised that UPOV 91-type PVP [Plant Variety Protection] laws overly restrict the traditions of seed management and sharing among farmers, thereby reducing the effectiveness and integrity of the informal seed system.” An open letter from 214 NGOs from around the world is also asking Dr Shakeel Bhatti, the Secretary to the International Treaty on Plant Genetic Resources for Food and Agriculture on Farmers’ Rights, to reconsider his approach to implementing UPOV-1991 in the Treaty of Farmer’s Rights . Instead, the letter invites UPOV and WIPO (World Intellectual Property Organisation) to agree to setting up an independent commission that will investigate its implementation with respect to recognising the enormous contribution that local and indigenous communities and farmers across the world have made to conservation and development of plant genetic resources which “constitute the basis of food and agriculture production throughout the world”; protecting traditional knowledge relevant to plant genetic resources for food and agriculture; farmers’ rights; and the farmer’s right to participate in making decisions at national levels. A yet further threat to African farming and food sovereignty is the New Alliance for Food and Nutrition, a G8 initiative disguised as a development initiative but in reality facilitates private sector investment . Ten African countries are so far involved, the majority not the most vulnerable to food issues in the continent. Companies that have invested in this initiative include Monsanto, Coca-Cola, Syngenta, Cargill and Unilever. The UK government has invested £600 million of aid money for the initiative, and as Polly Jones of the World Development Movement explained at the Parliament meeting, this initiative will be used to develop export markets, change policies and make it easier for companies to access land, seed markets and supply chains. Investing aid money to change policies of sovereign nations may even contravene the British government’s aid policy which states “We will not make our aid conditional on specific policy decisions by partner governments, or attempt to impose policy choices on them.” However, the ten nations that have so far signed up- Benin, Burkina Faso, Ghana, Malawi, Ethiopia, Ivory Coast, Mozambique, Nigeria, Senegal and Tanzania – have made more than 200 policy commitments that will make it easier for multinationals to do business in their countries. Some of these policy commitments include implementation of UPOV-91. The UK government should not be pressuring other nations to make these changes. The World Development movement has set up a petition to write to local MPs telling them that the people do not want our governments to interfere in sovereign nations for the benefits of corporations. Policy changes will have vast implications for people’s sovereignty, not just food but land rights, water rights, labour rights, and to a healthy livelihood as these new policies push for more chemical inputs into farming systems. But people are fighting back. Seed cooperatives are springing up, including one just being established now, with representatives from Biodynamics Association, Garden Organic and The Organic Research Centre, and based in Willow Hall Farm in north Essex. This builds on Stormy Hall Seeds based in North Yorkshire, which will eventually become a part of the cooperative that will produce, process and store seeds for retail and dispatch. These initiatives provide a practical hands-on resistance to the corporate takeover of seeds, something widely discussed at the event as one of the methods we need to support, expand as well as acknowledge as a practice already growing in the UK and in Europe. The challenges lie in scaling up these initiatives, providing seeds and resources for commercial scale farmers, not just gardeners and amateur growers. The Open Source Seed Initiative is an example of something larger that is currently lacking in the EU; it is a US resource for the conservation of seed that started in 2011. The initiative released its first sets of seeds in 2014, and was hugely popular, with nation-wide requests for 36 varieties of seeds from 14 different crops and even international requests from 8 different nations, highlighting the public demand for an alternative to patent-protected seeds . These examples are providing a successful framework to follow in the EU. On a larger scale, scientists such as Dr Melaku Worede in Ethiopia who won the Right Livelihood Award in 1989 have provided a great example to the world on how to save seeds, generate new varieties and connect the scientists to farmers, the people who know the most about the importance of seed. Instead of keeping a few seeds that are only useful as a genetic library and conservation effort, Worede has scaled-up the initiative with small-scale farmers to collectively revive and conserve large amounts of traditional indigenous seeds in the face of drought that could then be freely distributed among farmers. Creating community seed banks conserve genetic diversity at the level of local farmers, where seeds are dynamically and frequently exposed to changing environmental conditions, instead of being held in suspension in sub-zero temperatures for conservation instead of active use. A new film by Jess Phillimore for The Gaia foundation to be released in December explores the achievements of Dr Worede in resisting further erosion of seed biodiversity and food sovereignty. The Landworker’s Alliance, the UK arm of La Via Campesina along with WarOnWant have organised protests and have been campaigning against the EU seed policies as well as the proposed Transatlantic Trade and Investment Partnership (TTIP), a free-trade agreement between the US and the EU. The TTIP will see the EUs legislation on a wide variety of areas eroded down to US standards, including food safety deregulation, environmental deregulation, in addition to other areas such as workers’ rights, public services and personal privacy, and will likely see the spread of GM foods and seeds in the EU markets. The biggest lobbyists of this trade agreement are indeed agribusiness corporations. The negotiations are all held in secret so the implications of this deal remain completely uncertain at this time. A growing resistance to this agreement is becoming more visible, with for example a stop TTIP petition garnering 600 000 signatures in under a week in the EU. To sign this petition go to the stopTTIP.org website. Social mobilisation in the form of protests and campaign work have brought important international gains recently, and provide inspiring examples of what can be done to protect seeds by wider society at large. On the 5th of September, the Congress of Guatemala successfully repealed the Plant Breeder’s Variety Act UPOV-91 following mass protests from farmer’s organisations, local indigenous campaign groups and civil society . The Act should have come into force in September following signing by the Congress in June. This is a great victory in the fight for protection of farmer’s rights versus that of the plant breeder, an example that broad alliances between farmer’s, activists, civil society and wider society can challenge the giant corporations to successfully protect the rights of the seed and the farmer. Protests against UPOV-91 and the New Alliance have been growing across the African Nations involved, including Ghana and Ethiopia, providing hope that they will follow in the footsteps of Guatemala in resisting the corporate takeover of their food supply. The London Great Seed Festival and similar events across the country provide much needed resistance against the corporate takeover of seeds. The event included seed swapping, seed donations as well as workshops and seed guides to provide growers with a diverse variety of vegetables and the knowledge needed to successfully grow them. 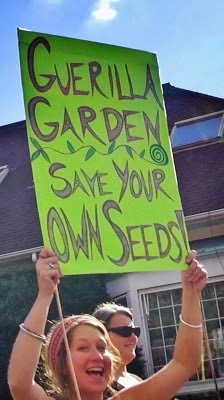 Providing seeds were the Seed Freedom Food Bank, Open Pollinated Seeds and Garden Organic’s Heritage Seed Library. In response to the looming threats on EU seed laws, these groups are seeing rising interest and participation in seed swapping, saving and home growing, as well as huge concern for the future of seed biodiversity and food sovereignty. The concern for their children’s health is another driving factor for people to take food production into their own hands or into local sustainable systems that they can trust. The pleasure of learning more about produce was also a key in drawing in the crowds. Adults and children participated in workshops on soil fertility and planting with the use of beneficial organisms like worms. Urban areas are increasingly seeing urban gardens springing up, as well as community gardens and school gardens to keep children in touch with food production. Food Growing Schools, also represented at the festival, is a recent project in London to bring together growing expertise with children, equipping schools with the tools they need. These initiatives are vital as traditional knowledge on seed saving and crop production has been lost to industrial farming. Events are popping up all over the country in local communities. These movements need to be supported and encouraged to grow, and more importantly, they need to be acknowledged. Biodiversity is in the hands of small farmers and gardeners, not registered in national reports that essentially analyse only industrial agriculture. As Patrick Mulvany said, only 1-2 % of UK citizens are farmers, but at least 4 times are growers, in gardens and allotments, and is an unacknowledged source of the UK’s biodiversity, providing already existing alternatives that can be expanded on. Bringing awareness to the rich resources that are on offer from nature and ours by right is the answers to food security. 3. 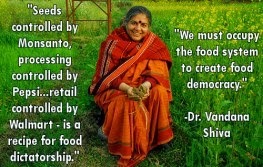 Sirinathsinghji E. GM Crops Destroyed by US Drought but non-GM Varieties Flourish. Science in Society 56, 6-8, 2012.